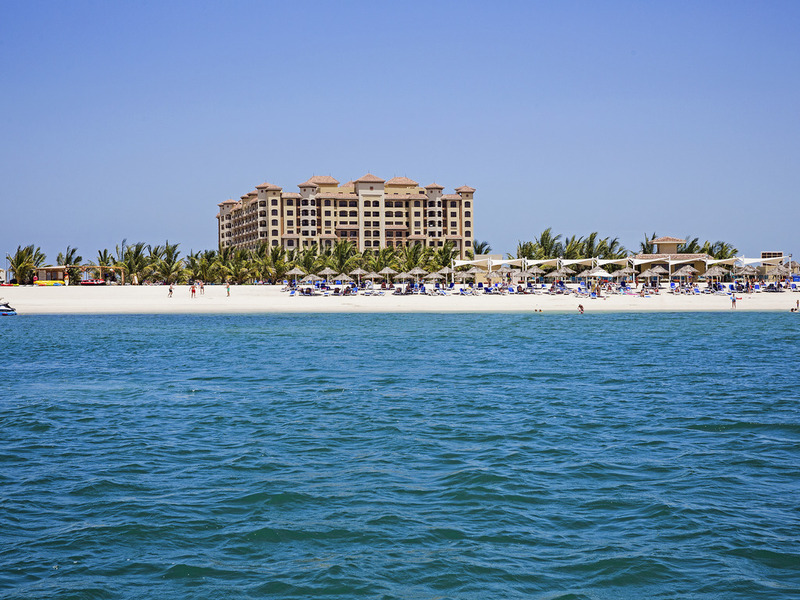 The only resort with two waterfronts located on Al Marjan Island is the perfect destination for those seeking relaxation and sports opportunities. Try dune bashing, camel riding and water sports or spend leisure time in the Hajar mountains. With its heritage sites, RAK is the ideal destination to experience the UAE not only with its skyscrapers but also with its culture and traditions, located just 45 minutes away from Dubai. Shopping can be enjoyed in one of the malls or traditional souks. The suite was very pleasant and spacious. It seemed clean, however when opening the curtains we found a childs toy on the floor previously hidden. The beds were very comfortable and the bathrooms were lovely. I had not seen pictures of the property and was disappointed by the balcony overlooking all the others and the main area where noisy entertainments for the children spoilt several intended quiet evenings sitting out there. The pool and exercise room were good, but there seemed to be no staff on duty in there. The jacuzzi was a little cool and we were forced to leave when unsupervised children came in and started jumping in and out. The food was very good quality and wide selection. All in all my family enjoyed their stay, but I would try a different hotel were I to stay in the area again. I would like to commend the lady working on reservations. I booked the hotel online only to discover I had made a mistake in the dates. I rang the hotel direct and the lady was exceptionally helpful, making it easy to amend the reservation with no problems at all. Amazibg Experience. My family enjoyed the stay. It was unpleasant stay, starting from the Front Office assistant Manager approach, whom for me was not professional, based on my experience in the same field for the last 20 years. Cleanliness was not acceptable in all the areas in the hotel including the rooms and the restaurants (knowing that i have stayed in 2 different room's categories and tried all the restaurants). Surprisingly that the hotel is only 5 years operational, whereas it gives more than 10 years with a need to refurbishment. I have a lot to say, but to brief it, the hotel's classification definitely does not deserve 5 star resort, especially in a country like UAE. for the following question, i could not click more than 1 option but i stayed 2 nights for business and 2 nights with family. I am a big fan of Accor but this was sadly not a good stay as the hotel fell short on basic things. Bed comfort was extremely poor (bedding, sheets, blankets very poor - only pillows were ok). General building quality was poor (e.g. air conditioning) and hygiene was questionable in many places, for example in the pool. On a positive note, the staff is good and spa was excellent. I was happy to get an upgrade to the suite 516, however it had bad odour and room lighting was quite dim. The swimming pool is smaller than expected so no space for proper swim. The sand beach was full of stones and rocks, it made it very unpleasant to walk and swim. The stay was &quot;Okay&quot;. The space is good. We arrived late (Around 17:00 hr) and the room is still not available despite the check in time at 15:00 hr. We got atleast 2 calls informing of the check out time which gives us the feeling of not being welcome. Staff has checked the Bar 15 minutes before we check out, which other hotels are checking the Bar after the guest leave the room. These are the points we noticed and stating not to complaint but that may assist the hotel to improve the service. Our stay at Marjan Island Resort was quite relaxing we all had a good time and even met our family friends who had also taken a break to relax. The ambiance, the professionalism and friendliness of the staff we interacted with during our stay was welcoming. The room was very clean with all amenities in place. The food was tasty and fresh and the Chefs were very friendly and accommodating to our request especially Chef Prama, very kind and always ready to find alternatives. Our morning breakfast was always something my daughter and her friend would look forward to and Romnick with his team of Milan, Maribel, Joyti, Saed, and Lejona were always happy to receive us. It was such a pleasure that even before you sit down they would anticipate your need and ask what you preferred. They were always organized and managed the tables very well even when the restaurant was very busy which was very impressive. The only area I think you need to look into is the checking aspect, especially when its busy. We did use the online check-in facility, unfortunately, it wasn't a pleasant experience and would prefer not to use the facility again as it does not work as you claim on the website. It was good staying at your resort. We had a relaxation. The food served was also good. We really enjoyed our stay. The breakfast was exceptional and alot of variety. Checkin and checkout went smoothly. My 2nd time here. Short weekend gateway. Lebanese restaurant food was my favorite. Room was specious and clean and room service fast. However I asked for fixing my bathtub 2 times and it did not happened. bathtub plug was missing seal and therefore bathtub did not hold water so as a result taking bath was impossible. Bit disappointed due to this. All in all very nice experience. The staff everywhere was polite, rooms are clear, breakfasts delicious. But kindly Consider the following things:1)the pool heating should be better, especially during cooler period of time; 2) think it would’ve proper to make an arbor or a pavilion, duribg too hot time to make outdoor activities more pleasant and during the rain, it was difficult to stay at room worh kids all the time-so the abive thing woul’ve made possible to be outside worh kids 3) wi-fi access for 2 person, with a big family like ours-it is not enough. My husband strugled to wor with his laptop,/‘since both of our phones were connected. Pre-stay: found out that your webpage is not up to date and no one even bothered to check until I escalated that. Due to which my plans have been changed. Unpleasant experience with your spa and recreation again. During stay: everything was normal. During check out: terrible experience! I called to see if I could do checkout by 1 pm instead 12 also explained that to avoid major crowd of checkout plus I could spent extra time on the beach. I was told no, however at reception I wasted almost an hour from 12:15 till 1:05. I was completely mad because my offer was rejected to nonsense where same 1 hour was spent at reception! The lady at silver priority counter totally ignored me and had to move to another side and personally myself offer to be checked out cause staff at counter didn’t bother to call me. Everything was handled very well and our week was perfect. Staff was helpful and kind, food was excellent, room was clean and spacious and housekeeping was great. No complaints. Very comfortable and enjoyable stay. Location is ideal. Facilities are great. We were upgraded to a premium room which was truly amazing. Thoroughly enjoyed our time there. However would suggest that the facilities available (eg sports and gaming) should be free or either very cheap as that adds to the fun part. Plus I had mentioned in booking that this stay was to celebrate my wife’s birthday yet there was no surprise planned. Very nice staff, always there to help you, good food and an overall good experience. The prices on the beach are really high, and I would've liked more things to do around. It was a really short stay, just overnight, so unfortunatelly we didn't use many services. The room was nice and everything else as well. Only at check-out they charged us for a drink from mini bar which we for sure didn't consume. As we were in a hurry to go to Musandam, there was no time to resolve the issue and we just paid.